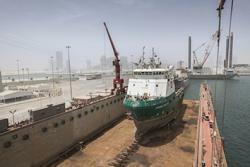 Abu Dhabi Ship Building (ADSB) is expanding the services they are offering at Mina Zayed Port by investing in a 180 metre floating dry dock which was purchased and towed from Turkey. The new floating dock was commissioned mid-July and offers a range of services including structural steel, mechanical, pipe and electrical repairs, state of the art hull treatment with the aid of robotic machines and tank coating work. The floating dock will be supported by new workshops established on the quayside. The new facility will allow ADSB to handle vessels that were previously too large for its headquarter facilities in Mussafah, which was limited to vessels of 80m LOA and a 2000 tonnes synchro lift. 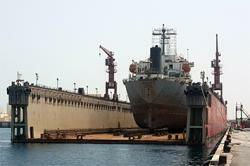 ADSB was originally setup in 1996 to undertake repairs and refits of UAE navy vessels. This new facility is a key element of ADSB aspiration to expand its commercial services enable the company to service the oil & gas industry and attract new customers. The offshore supply vessel Bourbon Liberty 108 was first customer to use the new floating dock undergoing routine drydocking, electrical and mechanical work.